This news story was published on March 15, 2019. 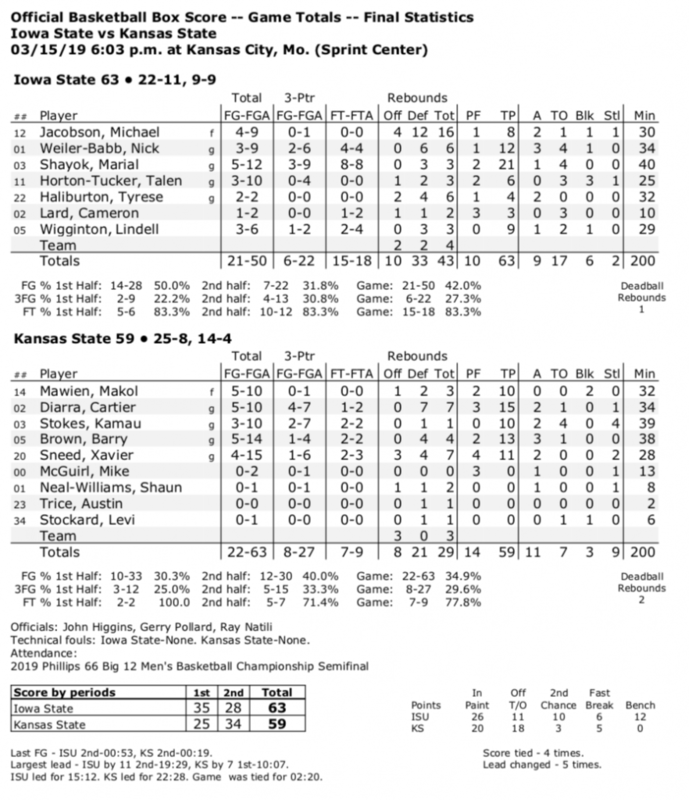 KANSAS CITY – Iowa State did what it does best Friday, which is advance in the Big 12 Conference Tournament with a 63-59 win over Kansas State. Marial Shayok struggled for much of the game but hit two big late threes when it mattered most, and Kansas State couldn’t recover. The game was a grind-it-out affair, which is typically Kansas State’s bread and butter. But Iowa State, which led by 10 points at halftime, rose to the occasion and did just enough to win despite shooting just 42% for the game. Shayok finished with 21 points, while Nick Weiler-Babb chipped in 12. Iowa State plays the winner of the Kansas-West Virginia contest in the Big 12 title game Saturday. Iowa State has won three of the past 5 conference tournaments.